The GSoC might have come to an end, but I am very happy with the progress that we have made porting the Plasma Active to KF5. In my previous blogposts i have describe some of the stuff which they have been ported. So at the moment a lot of the basic features have come back to the Plasma Active, so yes it is at a usable state 🙂 One of the big changes is that Nepomuk has been replaced with Baloo. Despite the fact that a lot of the Nepomuk stuff has been ported, there are still some things left, for example the timeline and tag support on the active-filebrowser. Unfortunately my exam period is starting soon so I will not be able to work more on Plasma Active for the time being. But I will be back when it will be over, which is in the end of September. You can find us on irc on the #plasma channel on irc.freenode.net. Hello, this is my fourth report for my GSoC. This week I have ported the Panel for Plasma Active. The UI of the Active Panel has not changed much. As you can notice some of the Plasmoids are missing because they have not been ported yet (like the Homescreen Plasmoid), but there is no missing functionality from the Panel. Also the notification icons are invisible while they are inactive, as this is the expected behavior. Hello, this is my third report for my GSoC. I was idle for the past 3 weeks, because I was in an exam period. So this week I implement the launcher for the Plasma Active. The launcher doesn’t come with a new UI, it is more or less a port of the old one. At the moment there is a bug with the search field (sometimes it loses the focus based on the application that is running in the background) but it will be fixed soon. Hello, This is my second report for my GSoC. This week i was working on the Wallpapers and the Activities Configuration. While there was the support for changing the wallpapers the UI was more focused on a desktop rather than a touch device, which wasn’t exactly what we needed for Plasma Active. So the new UI looks like the old one (Plasma Active 1), and the only small change is that we don’t show the wallpaper name. The Activities Configuration UI has been changed a little bit. So right now creating and editing an activity is in a different UI. Since when you create an activity, changing its wallpaper is not something that you will always do. The UI of creating a new activity it has been moved to the Activity Switcher. Hello, This is my first blog post about my GSoC project, porting the Plasma Active on KF5/Qt5. With libplasma2 we are able to reuse a lot of code which is being shared between Plasma Desktop, Plasma Active and Plasma Mediacenter. So what has been changed from Plasma Active 1? All of the basic Visual stuff is being located inside the toolbox package, containment package and shell package. All of the core functionality is inside the libplasma2. The toolbox package, containment package and shell package are written with QML2 so it is easier for bug fixing. The previous week i was working on the Activity Switcher (it is the sliding button on right of your screen), which is written in QML2. The activity Switcher is reusing the activities component for managing the activities. So the only real difference between the Activity Switcher and the desktop Activity Manager, is its layout which has been created with QML2. This week i was working on the Plasma Active Toolbox, which is written in QML2, and its using the libplasma2 in order to access the configuration panel and the widget explorer. 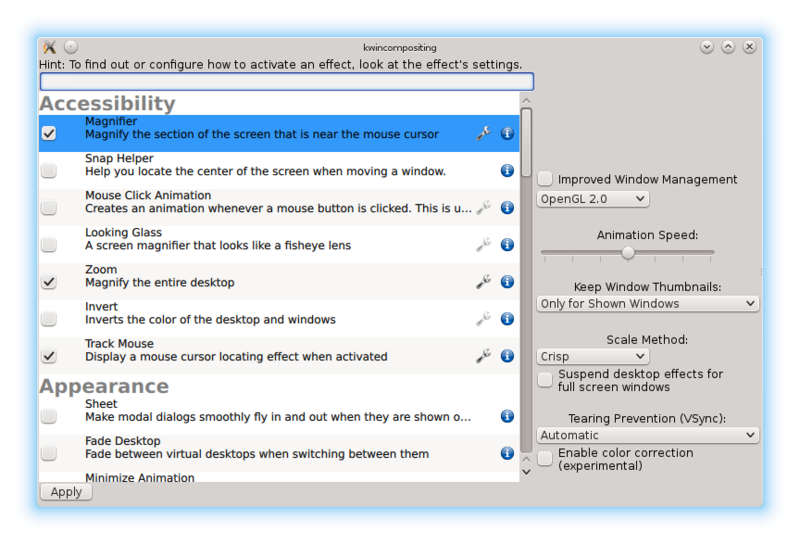 At the moment it will show you the desktop edition, but there are patches on the way for the configuration panel. So how can i build it? You will need KDE Frameworks, you can find more information about how to build them here. cmake -DCMAKE_INSTALL_PREFIX=$KF5 && -DCMAKE_PREFIX_PATH=$KF5 .. This year i took part on the GSoC and i was being mentored my Martin Gräßlin. My project was to port the KWin Effects KCM to Qt5. After a bit of research we decide that it will be easier to rewrite them back from the scratch instead of trying porting them. We wanted to have an application which is written completely in QML and we were able to do it because of the Qt Quick Controls. And in order to do that we had to make a lot of changes into the KWin Effects KCM, because it was based on Qt Gui so all the UI stuff needed to be rewritten from the scratch. So we came down to the conclusion that it would be easier to rewrite it. The name of the new application is KWincompositing. Also some of the KDE4 code did not make any sense on the world of Qt5. Furthermore, KWincompositing is using a more flexible model (QAbstractItemModel for those who are interested for the technical details) for loading the effects. The KDE4 model was coming out of a library which didn’t allow us to modify stuff. For example we didn’t had the ability to add an extra button for removing the effects which had being installed from the Get Hot New Stuff… And more cool stuff can be added, we might add an embedded video which will show the functionality of each effect. What are the advantages of the new UI? 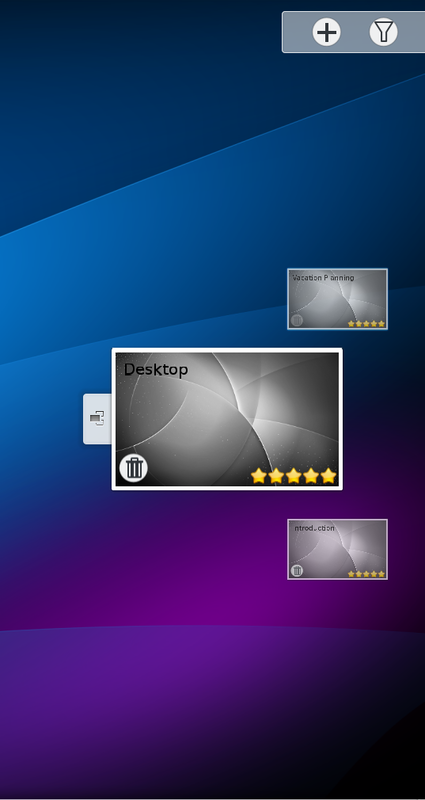 The new UI comes without any tabs, while the KDE4 version had 3 (General, All Effects, Advanced). The existence of the tabs was making some stuff harder for the user because he had to remember which option exists in which tab. On KWincompositing all the available options exist on one page. So you will no more have to navigate through the tabs. Also our new UI comes with more changes. E.X. 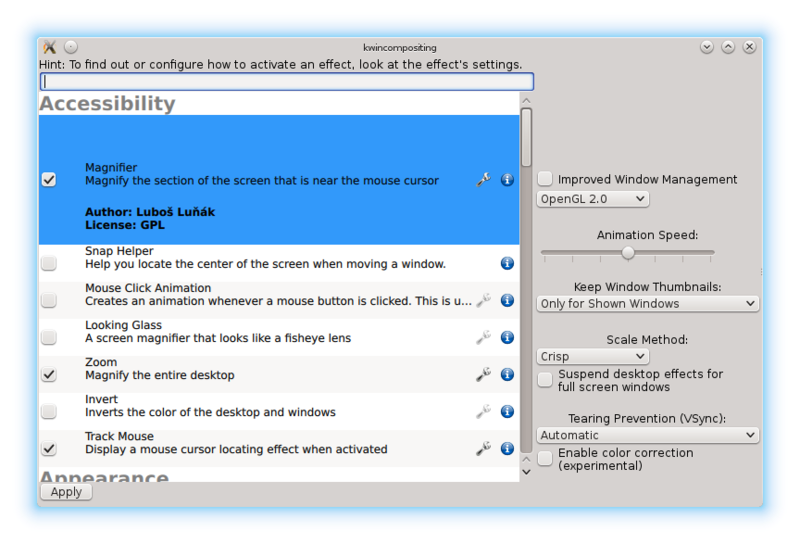 the about information for the KWin Effect, the KDE4 version was opening a new windows, while the KWincompositing is showing you the information inside from a dropdown menu. At the moment the KWincompositing is under development and it is not consider to be stable. How can i build it? After that you will need the kdelibs (frameworks branch), plasma-framework (master branch) and kde-workspace (master). Our code exists on master branch. For more information about how to build frameworks, you could take a look at the wiki. This year I am going to the Randa meetings. Randa is a small village in Switzerland. This is the first time that I am going to a KDE sprint and I am very excited about it. This year it will be the fourth sprint that will take place in Randa. I will work together with the Plasma team and mostly I will try to help with libplasma2 and Plasmate. The later is also related with my GSoC project. At this sprint we are all volunteers and as you understand there are some expenses like food and travelling. There is a fundraising campaign for the Randa meetings and If you want to help with those expenses you can make a donation at pledgie.